Study: Preserved Shark Fossil Adds Evidence To Great White's Origins; Once Grew Slower And Larger? MAIMI, Florida -- A new study examining the complex and dynamic interactions between white sharks and Cape fur seals in False Bay, South Africa, offers new insights on the physical conditions and biological factors underlying predator-prey interactions in the marine environment. University of Miami (UM) Rosenstiel School of Marine and Atmospheric Science assistant professor Dr. Neil Hammerschlag, and a colleague from the University of British Columbia, describe how sharks are camouflaged as they stalk their prey from below. Low-light conditions, from the optical scattering of light through water, along with a shark's dark grey back and the dimly light rocky reef habitat allow sharks to remain undetected by seals swimming at the water's surface. "Animal hunting in the ocean is rarely observed by humans," said Hammerschalg, director of the RJ Dunlap Marine Conservation Program at UM. "The high frequency of attacks by white sharks on seals at our study site in South Africa provides a very unique opportunity to uncover new insights about predator-prey relationships." Sharks typically search, stalk and strike their prey from below. The vast majority of predatory strikes by sharks and Cape fur seals occur against small groups of young-of-the-year seals. Predatory activity by sharks is most intense within two hours of sunrise and quickly decreases as light penetration in the water column increases. 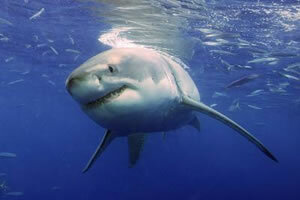 "Stealth and ambush are key elements in the white shark's predatory strategy," said Hammerschlag. Cape fur seals also have unique techniques to detect, avoid, outmaneuver and in some cases injure the white shark in order to avoid predation by sharks. According to the authors, if a seal is not disabled during the shark's initial shark, the small seal can use its highly maneuverable body to leap away from the shark's jaws to evade a second strike.